a tear proof, waterproof material resembling fabric. 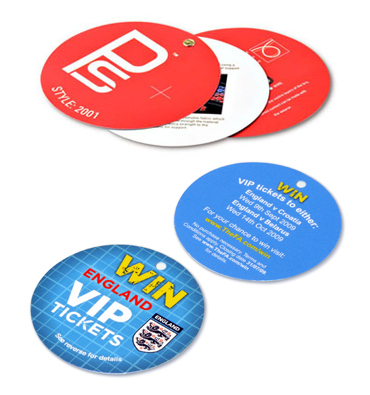 Design solutions may be simple or complex involving eyeletting, stringing and with the printed ticket, die cut to a special shape involving multiple pieces or pages with leaflets or other labels attached. We also supply our own patented none swing tag, the Wingrip, developed for fixing to cylindrical and problem products such as fishing rods that are otherwise difficult to identify with conventional point of sale devices.